Our Microsoft Office Training is completely tailored to YOU! Over the past few months I have been addressing your concerns one by one. Is this what’s holding you back? Concern #1: You don’t quite understand how the training works and if it would be suitable for you or your company. Solution#1: Book a free demonstration via Zoom. It will only take a couple of minutes and I’ll show you just how easy and interactive the training can be. Solution#2: You will be surprised how much I can fit in to just one or two hours of training. Gaining the right skills will actually save you time and money. Plus I provide discounts for new clients! Solution#3: I can deliver the training at practically any time and you can receive training from anywhere with internet access. Take the training in your lunch break, late at night or on the weekend. The training does not have to be taken all at once you can take it one hour at a time. Solution#4: My training is fully interactive, I will teach you by walking you through a serious of practical activities. I will give you the desired knowledge without the nerdy lingo, and the skills without endless hours in a stale classroom. Solution#5: Unlike most training offerings out there Savvy Training is completely tailored to your needs. You are able to choose which topics you want/need to learn - so you only learn what is relevant to you. I hope this puts your mind at ease. If you have any other concerns that you would like addressed please feel free to let me know. Solution#3: Take the training in your lunch break, late at night or on the weekend. I can deliver the training at a wide variety of times and you can receive training from anywhere with internet access. The training does not have to be taken all at once, you can take it one hour at a time. It recently occurred to me that most of my clients are living in major Australian cities, but who is this training particularly useful for? It's you!! 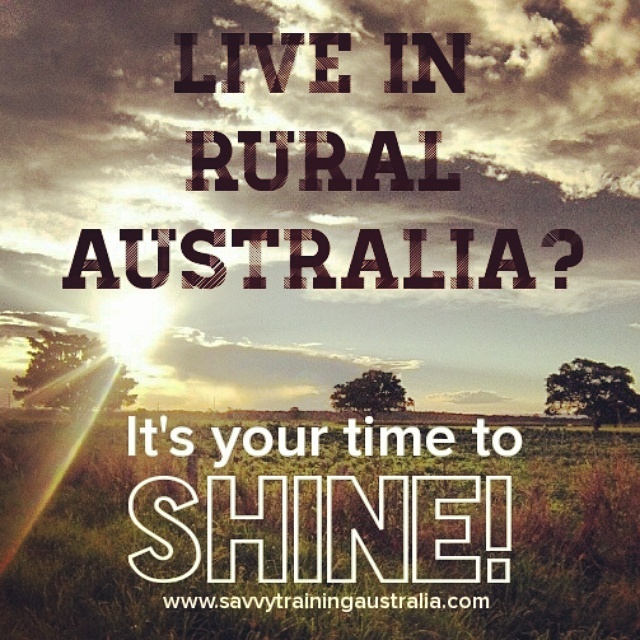 Those of you that are living outside the major cities - in the country / the sticks / outback / off the beaten track. You may not have access to all of the corporate training that those in the cities do, but you do have the internet and that is all you need to get Savvy. I’ve been running my own business for two years now. I’ve always believed in my product but after two years of successful online training sessions and numerous happy clients (both private and corporate) I have even more confidence. That is why I have decided to offer a money back guarantee for all courses beginning in March 2015. If you take training and are not happy with what you have learnt I will issue a full refund. We know you’re the ‘go to’ person in the office - the one everyone asks. You’re the one that juggles hundreds of different tasks in a day. You are in fact the back bone of the office. That is why during February and March I am offering 50% off my Microsoft Office online training for all Executive Assistants, Personal Assistants and Secretaries. I will give you 2 hours of personalised online training in the Microsoft program of your choice for only $50. You’ll be surprised how much you can learn and how much time it will save you in future. Contact me for more information. Above you'll find 3 very helpful keyboard shortcuts that will save you time whilst manoeuvring around in Windows. The first (Windows key + M) minimises all open windows and is therefore a very quick way to go back to your desktop. The second (Windows key + E) is a quick way to open Windows Explorer in order to access your folders and files. The third (Windows key + L) is a very quick way to lock your computer, very handy in an open office when you need to leave your computer briefly. Wanna see a movie? A short, informative and practical movie? I’m not gonna lie I was hesitant about pre-recorded training, e-learning, web tutorials etc. I’ve had countless people recommend I send my training in this direction but I’ve had my doubts. You see I love the one-on-one interaction that my Skype training gives me. It allows me to customise the training to the individual and to cater the training to their style of learning. Which is why I will always continue to provide that as an option for my clients. I do also now understand that pre-recorded training can have its place. It can be helpful for corporate organisations to upskill their staff in one particular area or for the busy individual that wants something to keep on hand that they can revisit as they need. That is why I have decided to release… (drum roll please) Savvy Flicks. They will be short, informative pre-recorded tutorials. You will be able to purchase them for unlimited future use. You might thinking.. why would I spend the money on one of these when I can just You Tube a training video? I’ll tell you why…QUALITY. These videos are carefully put together by an experienced Microsoft Office master trainer. They will be clear and easy to follow. You won’t have to watch hundreds of hours of mess to learn how to do something new. I will be releasing my packaged tutorials for you to purchase shortly so keep your eyes open. As well as that I have already began and will continue to be creating Customised Savvy Flicks these will also be short tutorials however they are created especially for your companies needs. They will be personalised demonstrations of how to use particular company spreadsheets or documents. You can keep them on hand to train future staff too. "Here’s lookin at you kid." Most people have dark memories of school. Okay so the school system is changing; but in times past it has leaned toward a certain type of learner. You know, the sort of person with a decent sized attention span that can learn quickly from a book or easily memorise before a test. The hands on learners weren’t so fortunate. Maybe you left school feeling good about your skills in dance or woodwork but decided that you weren’t the academic type. Let’s face it; we all have strengths and we all have weaknesses, but we can be taught almost anything, given that the teacher/trainer adapts to individual styles of learning. When you have a classroom full of students this is a little trickier to do. Which is why I love one-on-one training so much. Let me explain the reason for all this babble. I can teach you. Yes, you, the one that was kicked out of the classroom for talking or spent most of the day doodling in your notebook. First I will find out how you learn best then I will adapt the training to your needs. It has lots of excellent information about learning styles, personality types, team building, management and pretty much all things people. END OF FINANCIAL YEAR BONANZA! The end is near.. the end of the Australian financial year that is. This is a good enough excuse for a discount.. bonanza if you will. Starting now and ending 30 June you can have 3 hours of personalised Microsoft Office training via Skype for only $75! This is 50% off. You can choose any Microsoft Word, Excel or PowerPoint topics and learn them at your own pace. You will also receive free handouts for the topics you learn and 30 days post course support where you can email me with any questions. Sounds like it's time for you to upgrade your skills the convenient and affordable way. I also do gift vouchers so if you know of someone that could do with some training why not buy them some skills?